Wealth Words is an app meant for people who are fond of solving crossword puzzles. If the name of the web app is considered in the literal sense, then one can make money buy solving the crosswords. 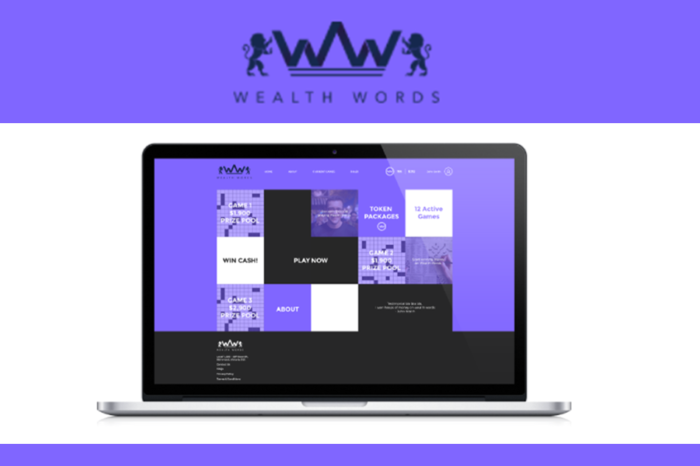 As a matter of fact, players have the opportunity to earn good amount of money, if one is good with crosswords, at the wealth words website. The layout of the homepage is masonry and is quite appreciable and the color combination is simple yet elegant. The background is white which keeps the player focused on the game and not get distracted by different colors, also the designs are pretty minimal which helps the player concentrate. The website’s connection has “https”, so one does not need to worry about dropping in personal details. One just needs to be an adult (i.e 18 years or above) to be eligible to play and all that the player needs to do is, sign up to the website, in a similar way any account is created online. Post the sign up, some tokens need to be purchased to be able to play. Each token costs $2, but then if one can buy more number of tokens at one time, then that is cost effective. Some of the puzzles are completely free, some require one token and some require more than one token, to be played. The ones that come free of cost can only be played only after playing the ones that require tokens, and that too multiple times with various types of answers. Each puzzle lasts for 24 hours and one puzzle needs to be played within 1 hour. 1 hour later the puzzle is concluded and the result is published. If the player is lucky, then has the chances to earn good amount of money. The game is addictive, fun and interesting. Additionally it gives the platform to earn good money. One can earn from $100 to $1000 in return for the $2 spent on the tokens. It combines fun and business. The website contains properly explained rules and tutorials. Most players have no complaints about the puzzle gameplay. – Pre-sign up there should be some trial games so that users can first get a feel and then register. This would not only let people understand the game, but also get some confidence and motivation to play well. – The age bar is not an absolute requirement. If kids below 18 years could be allowed to play without paying any money then that would have had more users for the webapp and more and more kids could have had fun. Topping it, a word game is always beneficial for children as they get to learn new words, they get inquisitive about the meanings of these newly learnt words, thus increasing their vocabulary. – If the makers of the app could give about 4-5 complimentary tokens during sign up, then that would make many users sign up. If there is a comparison made, then the pros outdo the cons completely. The game is definitely worth playing. It is an addictive and amazing game that even helps one earn good amount of money.